The Customer offers 24/7 international medical and travel assistance, equipped with helicopters and small jets landed in Athens for handling any medical emergency. – Medical reports and expert opinions etc. The key entities under the CRM management module are employees, medication incidents, and accidents. Employees – doctors and medical desk where all communication details are logged and safely stored (emails, calls, docs, diags). Accidents where time is sensitive and the appropriate procedure must be chosen and followed by the patient or and the medical team. Our Customer evolvement is to ensure that his international and domestic clients have a complete set of solutions to deal with these obstacles always according to the three universal fundamentals of healthcare: Access, Quality and Cost. 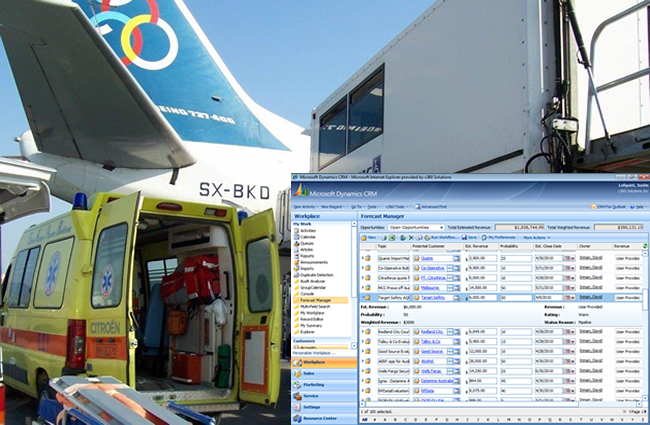 With Microsoft CRM we implement for each case a customized to our customer’s needs cost containment strategy, aiming to provide all needed report for the medical cases and to gain an economic balance for all involved parts.